In a large skillet on medium heat, heat 2 tablespoons olive oil. Add the onions, bay leaf and salt and cook until the onions turn a rich golden brown color and a few lightly crisp, stirring often. Remove from heat, discard bay leaf, and stir in the Worcestershire sauce. Set aside. Preheat a grill or large skillet over medium high heat and brush with olive oil to prevent sticking. Cook chicken until no longer pink and the interior reaches 160°F, turning once, about 4 minutes per side. Top each cooked chicken breast with 2 ounces cheese immediately after flipping. Assemble and serve: Spread the bottom half of each bun with 1 1/2 teaspoons Dijon mustard. 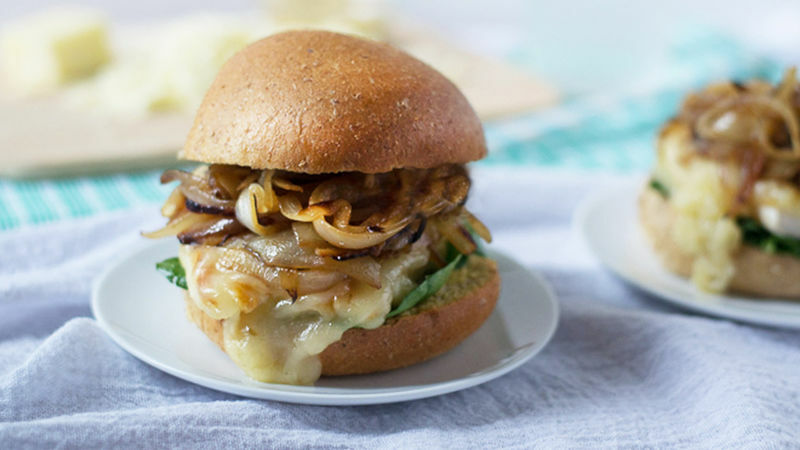 Top with fresh spinach, then the cheese-topped chicken, caramelized onions, and finally the top bun half. Serve immediately. These chicken sandwiches are overflowing with sweet caramelized onions and mounds of gooey cheese. Plus, they're easy to make on the grill or skillet. I’m totally that girl who brought a rolling suitcase on a camping trip instead of a backpack. I didn’t want my sundresses to wrinkle! Also, I don’t own a backpack. While I might not be the most “outdoorsy,” my friends are more than happy to a) invite me camping and b) place me in charge of the food. French Onion Chicken Sandwiches are one of my favorite recipes for campfire dinners, backyard grill outs, or an easy summer weeknight meal. 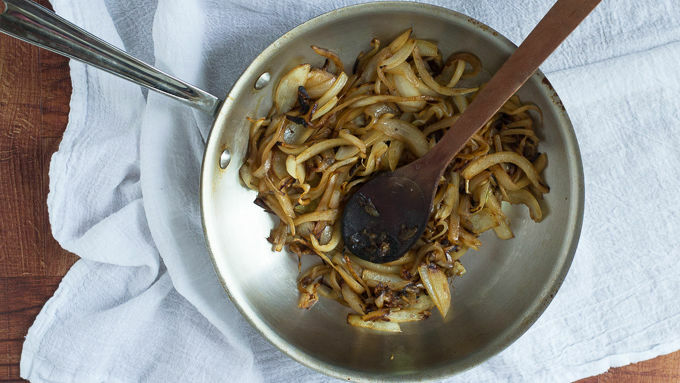 Prep the caramelized onions in advance, and you're less than 10 minutes away from a grilled sandwich that packs the gourmet flavor of French onion soup, yet is completely appropriate to eat while wearing flip flops. For a campfire dinner, toss the prepped onions into your cooler before you head into the woods, grill the chicken over the fire, then assemble the sandwiches at a picnic table. These are also a guaranteed hit at your next backyard barbecue – and if you're not lucky enough to own a grill (sadly, we do not), the chicken also tastes fantastic cooked in a cast-iron skillet on the stove. Now this is what I call fine dining. Please excuse me while I squeeze six of these into my rolling suitcase.